We established a novel surgical protocol for two-photon imaging of live mice liver with minimal invasion. With this technique, we identified the detailed structure of the liver during lipopolysaccharide-induced endotoxemia. We anticipate that this method may be utilized to determine the effectiveness of various reagents treatment to hepatic leukocyte migration. 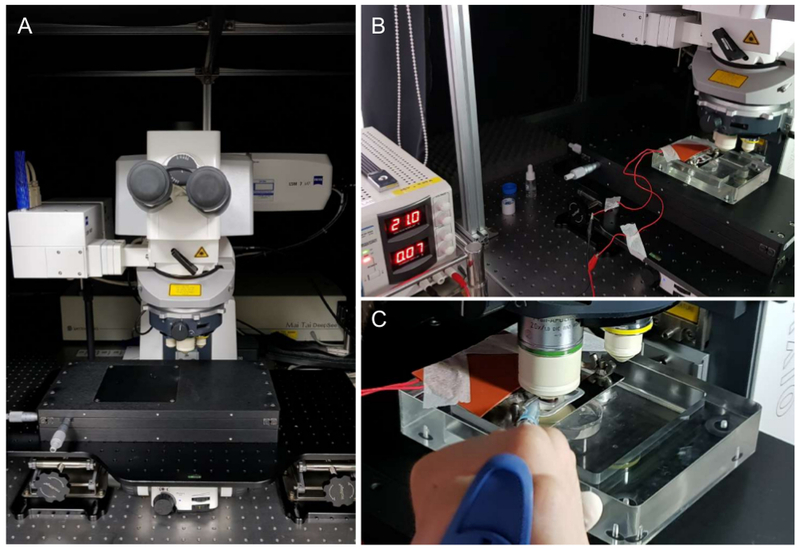 Park, S. A., Choe, Y. H., Lee, S. H., Hyun, Y. M. Two-photon Intravital Imaging of Leukocytes During the Immune Response in Lipopolysaccharide-treated Mouse Liver. J. Vis. Exp. (132), e57191, doi:10.3791/57191 (2018). Sepsis is a type of severe infection that can cause organ failure and tissue damage. Although the mortality and morbidity rates associated with sepsis are extremely high, no direct treatment or organ-related mechanism has been examined in detail in real time. The liver is the key organ that manages toxins and infections in the human body. Herein, we aimed to perform intravital imaging of mouse liver after induction of endotoxemia in order to track the motility of immune cells, such as neutrophils and liver capsular macrophages (LCMs). Accordingly, we designed a novel surgical method for exposure of the liver with minimally invasive surgery. Mice were intraperitoneally injected with lipopolysaccharide (LPS), a common endotoxin. Using our novel surgical approach for exposure and intravital imaging of the mouse liver, we found that neutrophil recruitment in LPS-treated LysM-green fluorescent protein (GFP) mouse liver was increased compared with that in phosphate-buffered saline-treated liver. After LPS treatment, the number of neutrophils increased significantly with time. Additionally, using CX3Cr1-GFP mice, we successfully visualized liver resident macrophages called LCMs. Therefore, to investigate the efficacy of new reagents to control immune mobility in vivo, determining the motility and morphology of neutrophils and LCMs in the liver may allow us to identify therapeutic effect in organ failure and tissue damage caused by leukocytes activation in sepsis. The liver is the major metabolic organ in mammals; it acts as a control tower for energy, hormones, and detoxification1. Due to its importance, researchers have conducted many in vitro and in vivo experiments to elucidate the changes in the liver during inflammation. Intravital microscopy has been used to capture live images from the liver2 . Indeed, various liver imaging methods have been introduced2,3,4,5,6. However, in order to develop a more simplified surgical approach and achieve stabilization of the target organ and the immune cells, we designed a simple protocol that can guide researchers to minimize their effort for intravital imaging. In this study, we introduced a stable and novel imaging chamber and surgical technique that could be used to minimize bleeding and possible infections. We confirmed that the liver remained intact for more than 2 h. With this method, we successfully identified morphologies of LCMs7 and neutrophils under septic condition. Since this method minimizes physical and biological confounding factors such as trembling and unexpected inflammation during surgical procedure, we anticipate that this method could be used to observe acute reactions of immune cells in the liver in response to reagents like LPS. All procedures were conducted in accordance with the guidelines of the Institutional Animal Care and Use Committee of Yonsei University College of Medicine, Korea. LysM-green fluorescent protein (GFP; gfp/+) mice8 and CX3Cr1-GFP (gfp/+)9 mice at 8-12 weeks of age were used for intravital imaging. All surgical tools were autoclaved and disinfected with 70 % alcohol. 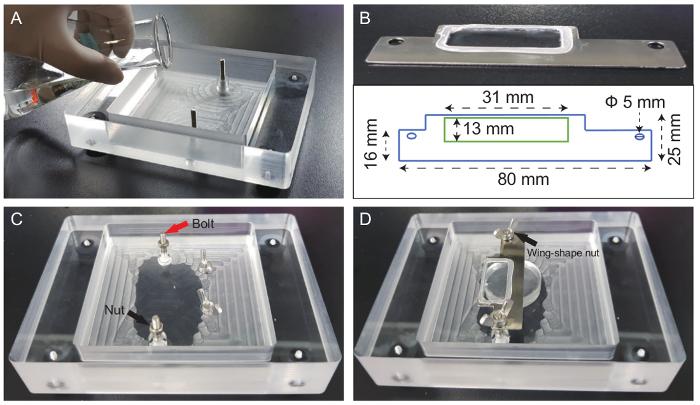 Make a chamber of the following size for mouse liver imaging (Figure 1): inner chamber (120 mm length × 160 mm width × 30 mm height), outer chamber (100 mm length × 100 mm width × 24 mm height), bolts (Ф 3 mm × 30 mm height), nuts (Ф 4 mm), and wing-shaped nuts (Ф 4 mm). Measure the curing agent and elastomer base in 1:9 ratio to make a total of 120 g of silicone. Put the liquid silicone mixture in a 250 mL Erlenmeyer flask and mix it well. Then put the flask in a desiccator and remove air bubbles for about 1 h under vacuum through the pump. Pour the liquid silicone mix into a custom-designed mouse chamber as high as 10 mm height and let it cure for a couple of days (Figure 1A). On the metal frame, attach the cover glass using silicone glue. Let it dry for 1 day (Figure 1B). In order to effectively hold the distilled water for the water immersion lens, a semipermanent water-blocking structure is essential. Make 1 mm rounding silicone glue and harden it overnight. Mix the curing agent and elastomer base and then pour it into a 6-well plate at a height of about 8-10 mm. Perform the hardening process as described in 1.1.2-1.1.4. Prepare sterile 1× phosphate-buffered saline (PBS) to dilute the LPS powder from Salmonella enterica serotype enteritidis. (1× PBS: 137 mM NaCl, 2.7 mM KCl, 10 mM Na2HPO4, 1.8 mM KH2PO4). Pre-heat PBS in water bath at 37 °C, and open the LPS powder bottle (25 mg) carefully. Using a pipet aid, pour the sterile PBS (5 mL) into the LPS powder bottle and gently stir or suspend the solution to prepare the stock solution. NOTE: After LPS powder is liquefied, harsh vortexing can cause bubbles. Avoid making bubbles to minimize loss when making aliquots in 1.5-mL tubes. Store the stock LPS solution at −20 °C, and dilute it into a 1 mg/mL LPS solution for injection. Inject the 1 mg/mL LPS solution (20 mg/kg) into the peritoneum of a non-anesthetized mouse using a 1-mL syringe. For the control animal, inject the same volume of PBS. Wait for 2 h for sufficient inflammatory response. Prepare two 15-mL conical tubes and 10 mL of sterile PBS. Dilute Texas-Red Dextran powder (25 mg) in 3 mL of PBS and mix it well. Transfer the mixture to an empty 15-mL conical tube. Transfer the remaining PBS (7 mL) to the 15-mL conical tube containing the dextran mixture (3 mL). Connect a 0.45 µm syringe filter to the tip of a 10-mL syringe. The syringe filter should replace the needle. Filter the dextran mixture (10 mL). Press the syringe evenly in order to avoid spilling. Dispense 500 µL of 2.5 mg/mL dextran solution in the light-blocked 1.5-mL tube and store it at −20 °C. Once thawed, store it at 4°C. Disinfect the surgery table and all instruments using 70% alcohol prior to the surgery. Then, set the tools for the liver surgery and adjust the heating plate to 37 °C (Figure 2A, B). For anesthesia, intraperitoneally inject the mice with 30 mg/kg of tiletamine/zolazepam and 10 mg/kg of xylazine. These solutions can be mixed and diluted in PBS for simultaneous injection. Confirm anesthetization by gently pressing the toe of the mouse. Proceed next step when there is no reflex. Apply small amount of eye ointment to prevent the dryness of mouse's retina. Remove body hair around the abdomen area using hair removal cream (Figure 2C). Inject 200 µL of Texas-Red Dextran solution (concentration of 2.5 mg/mL) via the tail vein or retro-orbital injection using an insulin syringe (Figure 2D). Mark the right subcostal area with a marker. The line should be drawn from the xiphoid process to the end of the rib. Cut the epidermis with forceps and scissors (Figure 2E, F). Open the abdominal cavity using micro-scissors and forceps, and expose the liver carefully. The left lateral lobe should be rolled out using cotton swabs (Figure 2G, H). Pour 500 µL of sterile PBS on the abdominal cavity to prevent dryness of the liver. Place the mouse in the right-decubitus position in a custom-designed chamber, and apply a small amount of tissue glue to the silicon bed. Then, carefully attach the liver using cotton swabs (Figure 2I). NOTE: Because the liver tissue is extremely friable, do not mechanically pull out the liver. Gently roll it out with cotton swabs. A few seconds later, wet the liver again with 500 µL of sterile PBS to avoid drying out of the liver. Place the metal frame on the liver and fix it firmly with nuts (Figure 2J). Run ZEN software (Carl Zeiss) to turn on the laser, set the wavelength to 880 nm, and set green, and red channels. Adjust laser power according to fluorescence intensity (Figure 3A). Emission filter information is as follows: Green/Alexa488, 500-550 nm and Red/Alexa 555, 575-610 nm. Place the chamber on the imaging stage and place the 20X water-immersion objective lens close to the cover glass. Fix the silicone rubber heater under the mouse body to maintain its body temperature (Figure 3B). Drop 500 µL of distilled water on the metal frame, and then pull the objective lens close to the liver (Figure 3C). Adjust the focus and determine the depth and time of the imaging area. For long-term imaging, inject half a dose of tiletamine/zolazepam and xylazine mixture each hour during imaging. Maintaining the body temperature of the mice at 37 °C is essential during this stage. Always keep on eye to the mouse, since anesthetization time differs from every mouse. NOTE: This method is not suitable for recovery after surgery and imaging. We ethically sacrifice the mouse immediately after surgery. Check the pedal reflexes for every 30 min for stable anesthetization. Open the data analysis software Volocity and then import the raw data in the library into the software. Remove noise from the image to suit the situation and take a snapshot. NOTE: To obtain smooth images, use the 'Fine' or 'Median' filter. Furthermore, use the 'Contrast enhancement' feature to make dark or blurry images clearer. Fit the edited items to 100% and export as JPEG or TIFF files for snapshot images and AVI files for movies. A simple and very stable imaging chamber was devised. The bottom of chamber was covered with silicone, which prevented slipping of the mouse body and organs. Additionally, because silicon has the proper amount of elasticity, it could prevent expected damage induced by the pressure of the cover slide (Figure 1A, C). Second, tissue-safe glue (Vet bond) was applied in order to fix the extracted liver on the circle-shaped silicone bed. This method enabled us to avoid trembling caused by heartbeat or respirational movement. Finally, a metal cover slide was placed and fixed by bolts and nuts based on the body size of the mice and the position of the protruding liver (Figure 1B-D). 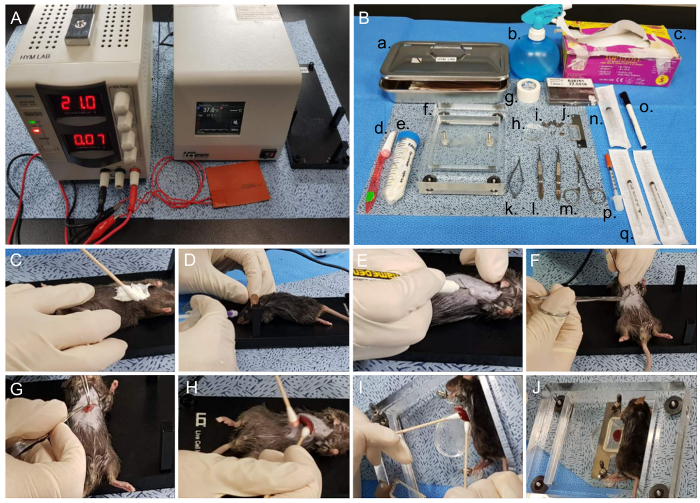 When anesthesia was performed properly, these imaging settings could last longer than 6 h.
Before starting surgery, the body temperature of the mice was controlled by placing the animal on a heating chamber that was pre-set to 37 °C (Figure 2A). Next, to prevent secondary infection, all necessary tools for mouse surgery and imaging were sterilized with 70% alcohol and/or autoclaved to prevent secondary infection (Figure 2B). Then, mouse body hair was removed, particularly from the abdominal area, with a hair removal cream (Figure 2C). Before making the incision, the skin was sterilized with povidone iodine. The blood flow was labelled with Texas-Red Dextran via vein injection (Figure 2D). A line that began at the xiphoid process and ended at the right ribs was drawn. This right subcostal incision line helped minimize bleeding. With a scalpel or micro-scissors, the dissection was started; the abdomen was not opened too much to avoid expulsion of the intestines from the abdominal cavity (Figure 2E, F). Fat and tissue layers were removed with forceps and micro-dissection scissors, and the incision area was cleaned with sterilized PBS and cotton swabs (Figure 2G). The left lateral lobe, the largest of the four liver lobes, was taken out with cotton swabs and then attached to the silicon bed using a tissue bond (Vet bond). As the liver tissue was extremely friable, the liver was moved out using cotton swabs (Figure 2H, I). After applying metal cover glass, the liver was subjected to imaging. To prevent dryness, sterilized PBS was applied to the space between the liver and cover glass (Figure 2J). The height of the cover glass was adjusted with nuts when needed. Two-photon microscopy was equipped with X, Y, and Z axes micrometer controller and shielded with black curtain (Figure 3A). The laser was stably mode-locked on the Zen software. To acquire stable imaging, drifting of target organ should be prevented. Therefore, in addition to imaging chamber and surgical method, the wires of the electronic heating pad were secured away from the imaging stage and well-organized by sticky tapes (Figure 3B). Lastly, a sufficient amount of distilled water was added to the top of the cover glass for the water immersion lens (Figure 3C). The blood flow was clearly indicated on the screen after intravenous injection of Texas-Red Dextran. In order to capture both red and green simultaneously, we performed imaging with a wavelength of 880 nm. According to intravital imaging analysis, an appropriate number of neutrophils was always circulating the blood in PBS condition. Whereas, the number of neutrophils in LPS treated mice was significantly increased. Note that a lot of neutrophils were circulating inside the bloodstream but they did not migrate outside the vessel in inflammatory condition. (Figure 4A, Supplementary Movie 1). 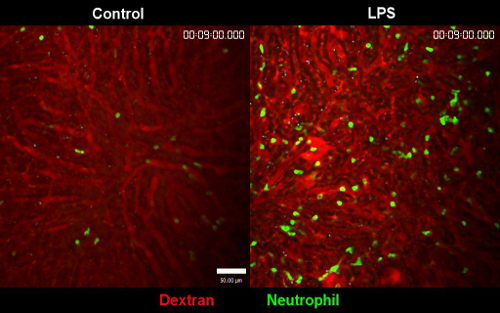 Neutrophils in the LPS-treated mice were more firmly adhered to the luminal surface of the vessel, which made more frequent detection of neutrophils in the vessel (Figure 4A, Supplementary Movie 1). 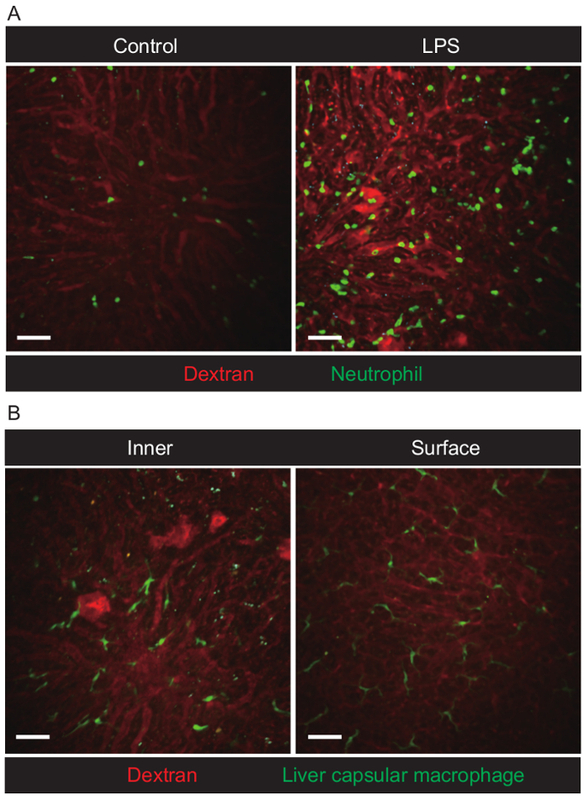 Apart from the motility of neutrophils, LCMs in CX3Cr1-GFP mice were observed on the surface of liver tissue rather than deep within the tissue (Figure 4B). LCMs showed little movement or activation in the liver even in LPS-treated mice. Figure 1. Design of liver chamber and subsidiary tools. (A) Pouring the silicone mixture into the custom-designed mouse chamber. (B) Dimensions of the metal cover slide (1 inch = 25.4 mm, Ф = diameter). (C) The image shows the plastic custom-designed liver chamber filled with silicone elastomer. (D) Other parts were used to assemble the liver chamber. Fixing bolts and nuts were made of iron. Arrows indicated bolts and nuts, respectively, in (C) and (D). Please click here to view a larger version of this figure. Figure 2. Surgical steps for liver surgery. (A) Metal and rubber heating plates at 37°C and DC temperature controller before surgery. (B) Overall surgery and supportive tools for liver surgery (a. Cotton swab and container, b. 70% alcohol, c. paper tissue, d. razor, e. hair removal cream, f. custom-designed chamber, g. surgical tape, h. home-made liver pedestal, i. wing nuts and nuts, j. metal cover slide, k. micro-dissection scissors, l. forceps, m. scissors, n. 3-mL syringe, o. marker, p. 0.3-mL insulin syringe, q. 1-mL syringe). Procedure for liver surgery (C-J). (C) Applying hair removal cream at the abdominal site. (D) Retro-orbital injection of mice with Texas-Red Dextran. (E) Marking the incision site with a marker. (F) Cutting the epidermis with forceps and scissors. (G) Making an incision into the abdominal cavity. (H) Pulling out the left lateral lobe gently. (I) Attaching the lobe to the liver pedestal using vet bond. (J) Image of the final set up. Nuts were fixed to the metal cover slide, and then the cover slide was fixed with butterfly nuts. Please click here to view a larger version of this figure. Figure 3. Settings for two-photon microscopy and imaging stage. (A) View of two-photon microscopy (LSM 7 MP) and the imaging stage, which can move in the x and y directions. (B) A liver imaging chamber with a rubber heating pad was attached using tape to cover the mouse. (C) Dropping distilled water with a pipette between the objective lens and cover glass. Please click here to view a larger version of this figure. Figure 4. Visualization of neutrophils and liver capsular macrophages in the liver of live mice. (A) Extended focus snapshot of neutrophils in the liver of LysM-GFP mice. The control image was from PBS-treated mice. The LPS image was from LPS-treated mice. Images were acquired using a 20X/1.0 NA water-immersion lens (field of view [FOV] = 424.3 µm × 424.3 µm, depth = 40 µm, slice Interval = 1 µm, time interval = 60 s, cycle = 31). Scale bar = 50 µm. (B) Inner and surface area snapshot of LCMs in the liver of CX3Cr1-GFP mice. Images were acquired using a 20×/1.0 NA water-immersion lens (FOV = 424.3 µm × 424.3 µm, depth = 40 µm (inner) / 10 µm (surface), slice interval = 1 µm, time interval = 60 s (inner) / 20 s (surface), cycle = 31). Scale bar = 50 µm. Please click here to view a larger version of this figure. Supplementary Movie 1. Comparison of PBS treated liver versus LPS treated liver. Clear difference in two different conditions is well observed. In LPS treated liver, the number of neutrophils is significantly increased and the motility is decreased. The stability of the movie in both conditions are observed. Blood flow is labeled with Texas Red dextran. Please click here to view a larger version of this figure. The liver has been actively studied by many groups3,10, due to importance of its function. For instance, Heymann et al. suggested a delicate method using agarose. Although this method was found to be highly precise, the agarose setting takes time. However, with our methodology, all procedures could be carried out within 30 min, minimizing other confounding factors. Second, stabilizing the liver is extremely important because the heartbeat can disturb the video. To eliminate this phenomenon, we repositioned the mice into the right decubitus position. Another critical step in this protocol was production of the metal cover frame and its location on the metal bar. The most important obstacle that we faced was to determine how to overcome the friability of the liver in accordance with liver fixation using an appropriate amount of pressure. Initially, when only the butterfly nuts were applied to hold the cover slide, the blood circulation was impeded, and the liver was unable to endure the weight of the cover slide. Instead, we devised a method to roll down the bolts prior to placing the cover slide along the bar. Since the cover slide was supported by bolts, it gave some space for the liver thickness and hereby, did not press down hard into the liver and yet maintained the balance and fixation. Using LysM-GFP mice6, we confirmed that this design could allow visualization of neutrophils in sinusoids and central veins. CX3Cr1-GFP mice5 were also used in this model in order to observe LCMs. LCMs were frequently found on the surface of the liver. The height of the liver pedestal or the silicon bed, was also essential. If it was too high, blood circulation in the liver would be disrupted. When the height of the liver pedestal was too low, it was difficult to maintain stable fixation of the liver. Because all mice had different body sizes, we produced silicon beds that had different heights using a 6-well plate, similar to that used for cell culture. In this way, we were able to customize the chamber according to the size of each mouse. In summary, we designed a novel and simple protocol for intravital imaging of mouse liver to investigate the morphology and motility of immune cells in the liver under inflammatory conditions. This new protocol could be very helpful to researchers in this field who want to observe acute immune response of the liver. However, with this method, researchers cannot conduct long-term imaging for longer than 6 h due to liver fixation with tissue glue. This protocol is a one-time only method, and therefore, mice should be immediately sacrificed after imaging. When the liver is detached from the silicon bed, the liver will eventually be stripped off from the bed, resulting in excessive bleeding. Therefore, re-insertion and suturing of the abdominal area is impossible for future observation. This study was supported by a grant from the National Research Foundation of Korea (NRF) funded by the Korea government (MSIP; grant no. 2016R1A2B4008199 to Y-M. H.), and the Ministry of Health & Welfare, Republic of Korea (grant number: HI14C1324). Girard, J. R., et al. Fuels, hormones, and liver metabolism at term and during the early postnatal period in the rat. J Clin Invest. 52, (12), 3190-3200 (1973). Marques, P. E., et al. Imaging liver biology in vivo using conventional confocal microscopy. Nat Protoc. 10, (2), 258-268 (2015). Dasari, S., Weber, P., Makhloufi, C., Lopez, E., Forestier, C. L. Intravital Microscopy Imaging of the Liver following Leishmania Infection: An Assessment of Hepatic Hemodynamics. J Vis Exp. (101), e52303 (2015). Honda, M., et al. Intravital imaging of neutrophil recruitment in hepatic ischemia-reperfusion injury in mice. Transplantation. 95, (4), 551-558 (2013). Jenne, C. N., Wong, C. H., Petri, B., Kubes, P. The use of spinning-disk confocal microscopy for the intravital analysis of platelet dynamics in response to systemic and local inflammation. PLoS One. 6, (9), e25109 (2011). Ritsma, L., et al. Intravital microscopy through an abdominal imaging window reveals a pre-micrometastasis stage during liver metastasis. Sci Transl Med. 4, (158), 158ra145 (2012). Sierro, F., et al. A Liver Capsular Network of Monocyte-Derived Macrophages Restricts Hepatic Dissemination of Intraperitoneal Bacteria by Neutrophil Recruitment. Immunity. 47, (2), 374-388 (2017). Faust, N., Varas, F., Kelly, L. M., Heck, S., Graf, T. Insertion of enhanced green fluorescent protein into the lysozyme gene creates mice with green fluorescent granulocytes and macrophages. Blood. 96, (2), 719-726 (2000). Heymann, F., et al. Long term intravital multiphoton microscopy imaging of immune cells in healthy and diseased liver using CXCR6.Gfp reporter mice. J Vis Exp. (97), (2015).